Beginning the Journey. Exit numbers will be the guide posts for exploring I-10. Because the exit numbers correspond to the mileage number from Arizona eastward to Texas, we begin our journey at the border of New Mexico traveling East on I-10 from Arizona. As you enter New Mexico from Arizona, mountains are visible on both sides of the interstate. This is the oldest path people used to travel from east to west in the southern United States. Pioneers heading west either came south or had to use the northern passages in Wyoming because the Rocky Mountains did not allow passage. This southern passage was used by wagons, stage lines, early railroads, and later highways. I-10 is only 164 miles long in New Mexico and connects the most western part of Texas, which is El Paso, with southeastern Arizona passing through southwestern New Mexico. It generally follows the second continental railroad line from Las Cruces westward to Arizona and highway U.S. 80. 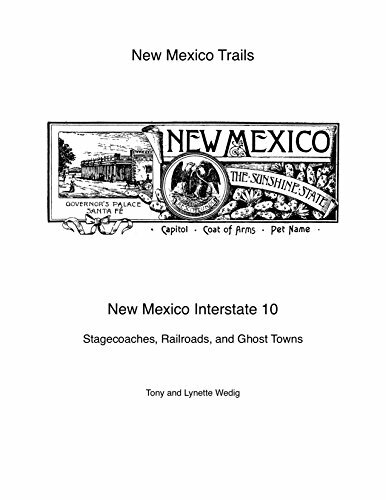 U.S. 80 was established in 1926 only 14 years after New Mexico became a State. As my wife and I traveled I-10 we each had revelations, insights and ah-hah moments along the way. My personal thoughts will be written in italic. My wife’s thoughts will be written in the website’s travel journal. The complete Stagecoach Journey can be found on You Tube. Part 5 is the journey through New Mexico and a stop at Animas Elementary School. One of the first questions you will be asked in New Mexico is: Red or Green? Did you know that “Red or Green” is officially designated as the state question? New Mexico food is smothered with chile sauce, not salsa. The chile sauce is created by using red or green chile peppers and either of the sauces can be hot or mild. If in doubt, ask your waiter or waitress, or do as we do and ask for the sauce on the side! If you are new to the red or green eating experience, then do what many locals do, eat it with every meal. The sauce is served on top of fried eggs, enchiladas, steaks, and whatever you choose. Green chile cheeseburgers are found in most restaurants and are one of our favorites. New Mexico is the largest grower of chiles in the world. The chiles are picked green and will turn red as they age and dry out. Wreaths of red chiles are a common decoration in New Mexico and can be purchased at many locations. New Mexico has two state designated vegetables - chiles and frijoles. Enjoy! At the Border. Looking south (right), the border area between Arizona and New Mexico contains a series of canyons that were called Smuggler’s Trails in the wild west and with good reason. These canyons create a natural passageway between the U.S. and Mexico. U.S. and Mexico have always had restricted trade on many items and these items flowed through the Smuggler’s Trail. This area was controlled by the infamous Clanton Gang during the old west. Their gang was called the “cowboys” and their clash with the Earps in Tombstone at the OK Corral has been relived in many western films. Click on the youtube link to see the video history of the Clantons and the fight at the OK Corral. The terrain at the border created a natural passageway through the mountains. The high mountains on each side of the passageway forced travelers to move through the gap area. The high mountains also created a perfect ambush area: Indians ambushing other Indians, Indians ambushing pioneers, outlaws ambushing anyone, Indians ambushing Army troops, and Army troops ambushing the enemy. Entering New Mexico from Arizona you will see signs about strong winds. The mountains you just passed through create a natural funnel that shoots the western winds into the high plains ahead of you. The high plains that surround you were once farm and ranch land until the water ran out. Scrub brush once held dirt from being blown away, but the scrub brush was cut down by the farmers! Tall grass held the dirt from being blown away, but the rancher’s cows ate the grass. No trees, little brush, and grass means wind blown dirt. It is not uncommon for the wind speed to exceed 50mph. High winds literally carry tons of dirt and visibility can be reduced to almost nothing in the high wind dust storm. People die every year in dust storm traffic accidents. Extreme caution is needed while driving in a dust storm. AM 1610 is the local New Mexico traffic warning station and will broadcast any hazard driving conditions. Most old west towns were mining towns. But not Steins, it was a railroad town. It was established in 1880 to provide rock for the railroad beds. The big problem for Stein was that it had no natural source of water and had to be brought in by railcar. Its peak population was about 1,300 people in 1910. In 1944 the rock quarry closed and the railroad gave notice that it would not be providing water to the town. The railroad offered the inhabitants of Steins free transport elsewhere with what they could carry. Most of the population accepted this offer, leaving their houses and many of their possessions behind. The Post Office in town closed at that time and Steins was soon completely abandoned. Some of the town later burned down. Along I-10 you will see billboards advertising “Western stuff” and many other things found in any of the Bowlin’s Running Indian establishments. This New Mexico travel center has been in operation for 100 years. They began soon after cars were on the roads in New Mexico and currently there are ten stores in the chain. Many began as a travel post or curio shop and later became a travel center. The outdoor billboard style of the past is kept alive with these travel centers. Store fronts and facades still dominate many of the stores. Yes, they do have what they advertise on the billboards and more. Where else can you get a tarantula paper weight, Indian wear, a coonskin hat or fireworks year around? Did the signs work and you stopped? Exit 5. This exit has a rest area and fuel station. The flat terrain is called the high plains and has an elevation of 4,200 feet. 4,200 is higher than almost all the peaks of the ski resort mountains in the northeastern United States! “Pearl Harbor Memorial Highway” is a designation for I-10 in Arizona and New Mexico. The USS Arizona was attacked in Pearl Harbor. Interstate 10 is also the “Veterans Memorial Highway”. Exit 15. The now nonexistent town of Gary, New Mexico was located to the north. Many early railroad towns were designed to be moved as the railroad moved. Gary could have been one of those towns. Today there is no remaining foot print of the town. Modern train information relay stations replaced the once active town. If anyone has information about Gary, New Mexico, please email us. Exit 20 - Rest Area and New Mexico Information Center. If time permits you might wish to spend some time in Deming, Silver City and/or Las Cruces. Excellent travel guides are available at the travel center for the entire state. The building housing the center was constructed in a traditional New Mexico style and the courtyard provides a sheltered table area. The rest area is worth the stop to stretch your legs and learn more about our state. The Lordsburg Port of Entry sign may seem odd at first. The station is the home of the border patrol and customs officials for this area. The Lordsburg station is responsible for monitoring 80 miles of the border. In 1927 the first civilian airport in New Mexico was located in Lordsburg. After Charles Lindbergh's flight across the Atlantic, he flew a "Spirit of Saint Louis" air tour which stopped in Lordsburg. In the 1920’s and 30‘s before I-10 was built, Lordsburg was about 600 miles from Los Angeles on US-80 highway. Lordsburg was one of the few places that would accept black guests, and so, it became a popular stop for African American travelers. The internment camp site is located along "P.O.W. Road" about 3 miles east of the town of Lordsburg; however, the area is posted with "no trespassing" signs in both English and Spanish. Camp Lordsburg held as many as 1,500 Japanese Americans in an internment camp. As WW II continued, Italians and German POW's were also held in the camp. A total of 3,000 Italians and 5,500 German POW's were housed within the camp. The area around the ghost town has been used since ancient times because it had what desert dwellers needed, water. The ghost town of Shakespeare began as a rest area, Mexican Springs, on the stagecoach route. After the civil war it was renamed to Grants. When silver was discovered the name of the town was again changed and this time to Raiston City after the banker who financed the mine. The town exploded to a population of over 3,000 residents. The silver mine quickly played out and the town was almost deserted. After a second precious mineral strike was discovered the name of the town was changed again because of its bad reputation. The company that discovered the gold and silver was named Shakespeare Gold and Silver Mining and Milling Company, so the town was renamed Shakespeare. The new town had schools, a newspaper, stores and, more importantly, real law. All went well until the railroad passed the town by and was located at Lordsburg. The mine closed in 1929 and the town died. When people left the town they literally took most of the town with them. Before Exit 29 look for an old car on the side of the road. What happened? Time for creative story telling! Exit 29 - Pump Station. Natural gas is piped from Texas to California. To keep the huge amount of gas flowing requires many pump stations located along its 500+ mile journey. The pipeline is large enough to provide most of the natural gas needs for Tucson, Phoenix, San Diego, Los Angeles and other communities along the way to the west coast. White metal posts with red tops denote the location of the underground transportation system. Generally these pipe lines are found between the railroad and the interstate. I found this to be so unique. This passageway has seen goods carried by feet, carts, horses, mules, oxen, cars, trucks, trains, and pipelines. The method of transportation has varied, but not the passageway. Exit 42 - Separ. Separ was once the location of a cattle town and watering stop for the railroad. It was also the home of Camp Henley during the Apache or Indian Wars. A telegraph line was built along side the railroad. During the Indian war this line was continually being cut by the Apache warriors to disrupt communications between the army camps and western towns. The communication solution came from a British invention that used mirrors and sunlight to send signals. The invention, called a Heliograph, was modified by the Americans. They used a square mirror and keying system to produce short and long flashes which resembled Morse Code. The mirrors could collect and amplify moonlight to transmit signals at night. 23 signaling stations were constructed in Arizona and New Mexico. With stations on the plains and in the mountains, messages could be sent hundred of miles within minutes. Exit 49. One mile past Exit 49 is the approximate location of the Continental Divide as it passes between the Grants-Luna county line. The Continental Divide separates the watersheds that drain into the Pacific Ocean and the Atlantic Ocean. Two miles up the interstate is a rest area. The Path Well Traveled. Prior to 1857 there was no commercial transportation business west of the Mississippi River. The term “overland” was not in existence. People did go west and return but there was not any business that regularly carried mail and people from the east to the west coast. John Butterfield, a New York business man, obtained a $600,000 contract to create a mail service from St. Louis to San Francisco. $600,000 is equal to $17,400,000 in today’s money. Mr. Butterfield’s task was to build a stage line to cover the 2,800 mile route. This task was monumental because maps of the area were sketchy at best. A southern route was needed to provide year around travel because the northern route was snow bound most of the winter. The route had to be planned and survey, with each station located 15 to 20 miles apart and each having reliable water. 150 stations were built with corrals and water wells if needed. Roads were created, supply stations constructed, 1800 animals purchased to pull the coaches, 250 coaches constructed, and 800 men hired to carry out the stage coach business. The stage took 25 days to travel the route with average stops of only ten minutes for food, restroom breaks, and a change of animals or reloading cargo and passages to another stage. The stages traveled 24/7/365 for their two and a half years of operation. Operational costs, mounting debt, competition by the faster pony express mail delivery, other stage lines and the outbreak of the civil war caused the demise of the Butterfield Stage line. Carrying mail and passengers quickly to and from the west was called express. A banking operation from San Francisco owned a competing stage line, Wells Fargo. They bought the Butterfield stage line and created an Express across America which was re-named American Express in 1873. On the Plains between Exit Signs. At about this point in the journey tall mountains will appear to the north (left side of vehicle). These are the Gila Mountains. If you have a day to go exploring then we suggest taking a side tour. The mountains contain the wonderful small town of Silver City, the Mimbres Culture Heritage site, and the Gila Cliff Dwelling National Monument. The area also contains the Fort Bayard National Historical site, City of Rocks State Park (this park resembles a big city made of huge rocks - very “out of this world” appearance) and the Catwalk of Whitewater. The Silver City Museum, The Big Ditch, Old Town and many art galleries are found in the town. The area you are now passing through was once home of the Mogollon people. These hunter-gathers started using large ceramic containers for food storage instead of woven baskets. The designs on the ceramic objects are generally black on white and very distinctive. The art work is called Mimbres pottery. By dating and tracing shards of the pottery a timeline of Mogollon can be created. These ancient people began living in the valley in dugout huts. Later they moved to the Gila Mountains and became Cliff Dwellers, building homes in a large cliff opening. As many as fifteen families lived in this cliff community. The reason these people vanished is still a mystery. Below are examples of the Mimbres pottery. The museum in Deming has the largest display of Mimbres pottery in the nation. The uniqueness of the Mimbres pottery has spawned dinnerware copies of their distinct patterns. Exit 62 - Rest area. Many ghost towns are gone and did not leave a foot print. Gabe was one of those and was located at exit 62. Exit 81-82 - Deming - WINERY ALERT. Deming has three wineries and is the largest wine bottler in New Mexico. At any given time, 200,000 gallons of wine are aging. During the peak production, 100,000 gallons of wine are produced and 25,000 bottles are filled a day. Two tasting rooms offer you samples of these New Mexico wines. Deming. Before the railroad, Deming was on the Butterfield Overland Stagecoach route. Deming had water and at one time it was called the City of Windmills. Windmills were used to pump the water from the aquifers to the farms. Today, more acres of green chile are grown in the county than anywhere in the state. Much of it is processed at Deming's Border Foods, the largest green chile processor in the U.S. In 1881, a silver spike was driven in the rail to denote the completion of the Second Continental Railroad - the joining of the Southern Pacific with the Atchison, Topeka & Santa Fe Railroads (ATSF). Charles Crocker was the owner of the Southern Pacific Railroad and the town of Deming is named after his wife, Mary Ann Deming Crocker. When the two lines were joined, Deming received a “union station” building (name denotes shape of building) used by both railroads. It was a large two story structure that served as both the depot and a hotel. In addition to the depot and hotel, a Harvey House restaurant was added. Before the advent of dining cars, passenger trains would stop at stations to allow guests to partake of meals. English immigrant Fred Harvey teamed up with the ATSF to create a chain of fine dining establishments along the ATSF lines. In 1930, the station was remodeled into a one story building with wood clapboard and tall, full length windows. It had a hipped roof and deep eaves to protect passengers from the hot desert sun. In 2004, the station was relocated to Pit Park where it can be admired by visitors. The moving of Deming's Railroad Depot was featured in The History Channel's series, "Mega Movers", where the historical site was lifted from its previous location on the railroad and moved. The Deming Chamber of Commerce now occupies the building. The first armory in New Mexico was built in Deming in 1915. Today the building houses the local museum. This museum contains a large collection of western era collectibles including a horse drawn chuck wagon. The museum is divided into rooms that allow you to travel back in time and view the area as it once was. In 1942, the Deming airport was transformed into the Deming Army Airfield, a bombardier training site. 12,000 cadets passed through the school in three years. The military air field closed in 1946 and the facility once again became the Deming airport. On the right is the Army Air Force Bombardier School Patch. The third weekend in August features The Great American Duck Race. The weekend includes dry duck races, wet duck races, duck completion, a carnival, various venders, and a Duck Parade. Digging for Mimbres pots is not allowed except in Rock Hound state park. The park is filled with many minerals and the most popular is the “Thunder eggs”. Volcanic conditions created these geodes 20 to 40 million years ago. Thunder eggs are spherical shaped hollow rocks. Along the Way. In your journey you have passed several New Mexico roadside markers. Each of these markers has the same basic design - large wooden posts creating the sign holder. This design is over seventy years old and has always been used to attract motorist to stop and learn about this unique state. In 1936, sign construction began and today over 700 markers commemorate important events, places, people (both honorable and notorious! ), and geographic marvels. Also along the way you may see a roadrunner, the State Bird. This bird can be up to two feet long. The roadrunner is the fastest running flying bird in the world and has been clocked running up to 26 miles per hour which is about the speed of the fastest running human ever. Some Pueblo Indian tribes believe that the roadrunner is a protector against evil spirits. As a distraction, you can watch a few of the 48 Roadrunner cartoons on youtube. Wile E Coyote was the nemesis of the roadrunner and was named one of “The 60 Nastiest Villains of All Time” in 2013. Exit 132. At the rest area you will discover a great photo location. On the hill sits a roadrunner made of used metal parts. This hill top view is simply spectacular. Las Cruces can be seen in the river basin below and the Organ Mountains in the background. Exit 135 - 144 - Las Cruces. Before entering Las Cruces proper you will cross the Rio Grande River. The river is 1,896 miles long, begins in Colorado, passes through New Mexico, and becomes the border between Texas and Mexico as it heads into the Gulf of Mexico. The Rio Grande is the fourth longest river in the country. The once mighty river is now a shallow image of its past self. Several dams up stream contain and control the water. Las Cruces is the second largest city in New Mexico with a population of over 100,000 residents. Las Cruces is the hub of commercial activity in southern New Mexico and has amenities of a much larger city. Use the links to get detailed and up-to-date information on events and activities in the area. If time permits, stay for a day and enjoy Las Cruces, the city of crosses. Description: During the colonial period, the early settlements of New Mexico were connected to the outside world by the Camino Real de Tierra Adentro, or the Royal Road to the Interior Country. The route followed the the Rio Grande valley south to El Paso and then through the provinces of New Spain to Mexico City. Exit 140 - Las Cruces - Old Mesilla (Old town). Explore the shops and restaurants along the plaza and surrounding area. See the town as it was and enjoy the video tour of Old Mesilla. Brief History of Las Cruces. At the time of the first Spanish explorers, the area was inhabited by the Manso and Mescalero Apache Indians. In 1598 (twenty years before the Mayflower landed), the Spanish began to colonize the area. All territory north of the Rio Grande River was claimed for New Spain. This area later became the Spanish Territory of New Mexico. In 1821 the area was reclaimed by the Mexican Empire. The Republic of Texas also claimed the area until the end of the Mexican-American War in 1848. The treaty of Guadalupe Hidalgo in 1848 established the United States as owner of the territory and Las Cruces was officially founded in 1849. In 1881 the railroad linked Las Cruces to other U.S. cities and the town began to grow. New Mexico State University, an agricultural college, was founded in 1888. At the end of WW II all the German scientists, machinery, spare parts, and completed rockets were secretly shipped by rail to the White Sands area located east and over the mountains from Las Cruces. This became the birthplace of the U.S. rocket and space program which today is known as the White Sands Missile Range. The NASA facility in Las Cruses was a joint supporting element in the beginning of the US space program. Leaving Las Cruces. The big orchards with tall trees you see from the road are pecan orchards. On the interstate connecting Las Cruces and El Paso you will see orchards with new smaller trees. A pecan tree needs about four years of care before it begins to produce. Pecan trees require a great deal of water, fertilization, pest management, pruning and harvesting. In order for the pecan orchard to be productive, it requires constant care and monitoring. The orchard between Las Cruces is in the Mesilla Valley and owned by the Stahmann family. This is not only the largest pecan orchard in New Mexico but in the United States. Combining their US operation with their Australia orchards, they are the largest producers of pecans in the world. It all began in the 1930’s with their first commercial orchard in New Mexico. Their web site is www.stahmanns.com. Exit 162 - Anthony. The town got its name from the chapel St. Anthony of Padua some time before 1884. This railroad town between El Paso and Las Cruces saw little growth and did not incorporate until 2010. In 1988 the chamber of commerce named the town the Leap Year Capital of the world and created the Worldwide Leap Year Birthday Club. This was a wonderful surprise. We have visited many transportation museums, including the Smithsonian, and this ranks in the top five on our list of museums. This museum was just the right size for an afternoon visit, and the information about each aircraft tracked its ownership from the factory to the museum and discussed its importance in history. End of the Journey - El Paso. Welcome to Texas. Stop at the Visitor’s Center for info about The Lone Star State. Most southern New Mexicans travel to El Paso to shop, attend events, visit medical facilities and doctors, or depart on a journey from the El Paso International Airport. Please return to the Homepage and make a contribution using Pay Pal. THANKS! This trail is also available on Amazon.